2019 Ducati Multistrada 950 S. Picture credits - Ducati. Submit more pictures. For the first time, the Multistrada 950 is available in the S version: the maximum in terms of technology, performance and comfort. The bike is equipped with electronic suspensions with the Ducati Skyhook Suspension (DSS) Evo system, Ducati Quick Shift up and down (DQS), full-LED headlight with Ducati Cornering Lights (DCL), 5� colour TFT display, Hands Free system, Cruise Control and backlit handlebar controls. Driveline: Chain; Front sprocket 15; Rear sprocket 43. Primary drive: Straight cut gears; Ratio 1.84. Ask questions Join the 19 Ducati Multistrada 950 S discussion group or the general Ducati discussion group. Enter your e-mail to join the 2019 Ducati Multistrada 950 S forum and get notification of answers and new messages about this bike. You can unsubscribe with a single click. Bikez does not display, sell	or misuse e-mail addresses. Bikez.biz has an efficient motorcycle classifieds. Ads are free. Click here to sell a used 2019 Ducati Multistrada 950 S or advertise any other MC for sale. 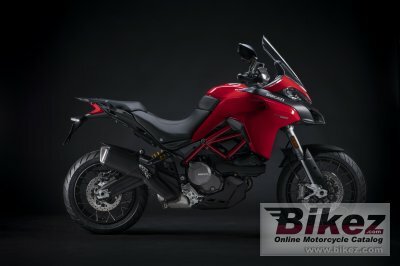 You can list all 2019 Ducati Multistrada 950 S available and also sign up for e-mail notification when such bikes are advertised in the future. Bikez has a high number of users looking for used bikes. Before you buy this bike, you should view the list of related motorbikes Compare technical specs. Look at photos. And check out the rating of the bike's engine performance, repair costs, etc.